I am a Graduate student at CSU Long Beach and I have spent this past summer as a Wrigley Institute Summer Fellow conducting my research in Big Fisherman’s Cove on the effects of catch-and-release fishing on kelp “Calico” bass (Paralabrax clathratus) and barred sand bass (P. nebulifer). The objectives of my Master’s Thesis project are to 1) Determine how the trauma from being caught and released affects fish physiology and behavior, 2) Measure survival rates and how rapidly fish recover once released, and 3) Identify specific things fishermen can do to minimize stress and promote recovery in these valuable recreational species. Recreational fishing has historically been an important part of California culture, and every year more people are heading out on the water to enjoy this activity. Fishing regulations (e.g. minimum size limits, daily bag limits, etc.) are common tools used by fisheries managers to prevent the overfishing of popular gamefish, and these policies often result in the mandatory release of fish after they have been caught and handled. But catch-and-release can be a traumatic experience for fish which are stressed from fighting to escape, being exposed to air, and possible physical injury from fishing tackle or the handling process. The stress can affect fish growth, reproduction, and behavior as well as potentially reduce the growth or recovery of the entire population. For many important recreational gamefish, these species regulations are used without any knowledge of how fish respond and recover after being released –yet these are critical things to know to ensure that the most effective measures are being employed. Understanding the impacts of recreational fishing activity on kelp bass and barred sand bass is particularly important right now, given the large declines in population size observed in recent years and their value as two of the most caught species in southern California. My research aims to relate physiological stress responses (e.g. hormonal and metabolic changes) with behavioral responses (e.g. movement and activity) of fish that are caught and released. I have spent this past summer catching kelp bass and barred sand bass in Big Fisherman’s Cove, a local marine reserve. From blood samples collected after fish are caught on hook and line, I can measure the levels of cortisol (the major hormone that regulates the stress response), glucose (i.e. energy), and lactate (i.e. 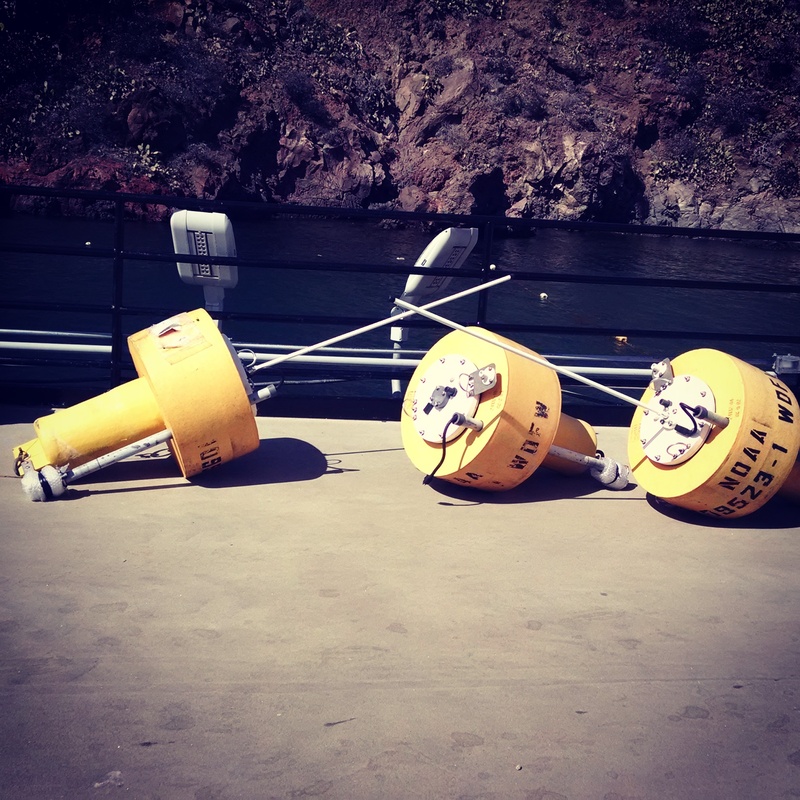 indicator of exhaustion) to determine how stressed these individual fish are from being caught and handled. The fish are tagged with a unique ID number, released, and then recaptured after varying hours or days in the wild to determine how quickly the fish recover back to their normal, unstressed state. 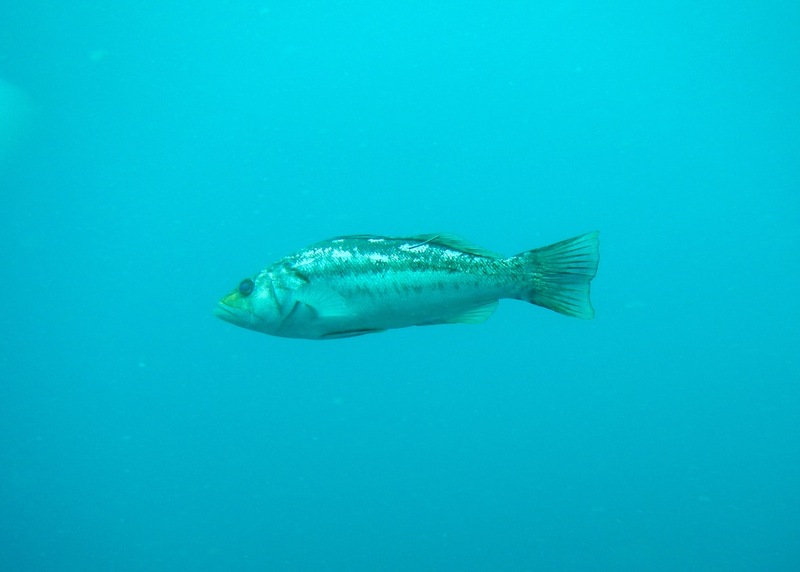 Preliminary results suggest that kelp bass and barred sand bass are extremely hardy species, and are often able to recover physiologically within 24 hours. However, the data also suggests that the longer fish are fought on the line and exposed to air, and the rougher fish are handled (e.g. dropped, carried by gills or jaw, etc), then the longer it takes for those individuals to recover. I hope to continue my research at Wrigley Marine Science Center throughout the fall and spring, and return next summer as a Wrigley Fellow. Upcoming research will involve capturing and tagging fish with a small acoustic transmitter that is detected by listening stations (i.e. receivers) that are set out around Big Fisherman’s Cove; these transmitters provide information on the fish’s location and depth over time, allowing me to observe how behavior is altered when fish are released and how long it takes before individuals return to normal activities and movements. 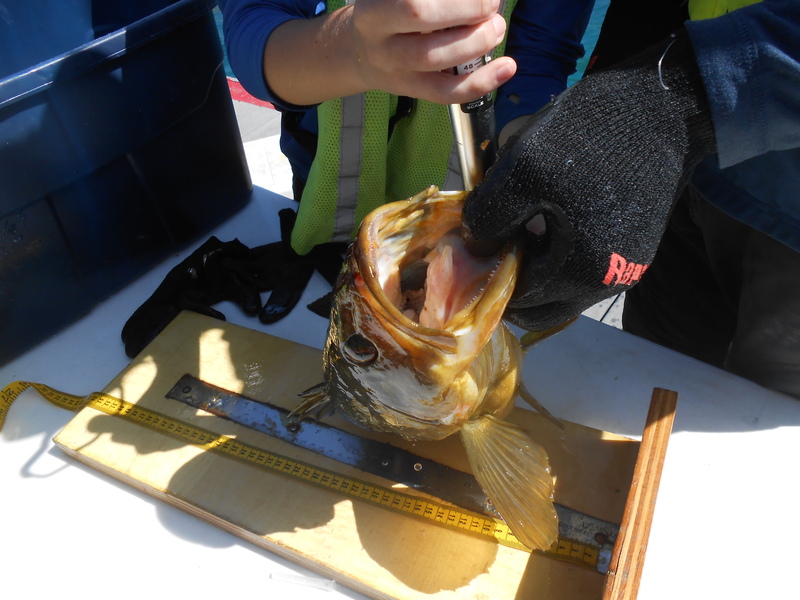 Ultimately, this research will help inform fisheries managers of the effects of catch-and-release fishing on kelp bass and barred sand bass. The work will also provide information that will educate recreational fishermen to promote survival and recovery of these important gamefish, ensuring future opportunities for generations of California fishermen. Caitlin is a Masters student at California State University Long Beach in the “Shark Lab‘ under Professor Christopher Lowe. This entry was posted in Graduate, Wrigley Institute on August 25, 2015 by Jessica Dutton.